The last year has been a blur. My time has been consumed with traveling, taking care of elderly parents, teaching last spring, and dealing with Hurricane Rita. My parents live in an area of Southeast Texas that was greatly affected by Hurricane Rita. My parents' home received severe damage which prevented them from living in their home. Of this date no repairs have begun and we are still working with the insurance to agree upon the extend of the damage. As expected the insurance company is being very conservative and wanting to settle the claim quickly. I am fortunate to have the freedom to move to the area and help my parents through this nightmare. I know of many people that do not understand that such a terrible force of nature can cause unseen damage. They are settling with the insurance company too quickly so that they can patch, paint, and fix all the cosmetic damage. After this is over, I plan to publish detailed tips to prepare and live through a storm or other catastrophe. I would like to start this spring before the 2006 hurricane season begins. List below are two importanat tips to get you started with pre-storm preparations. These are off the top of my head and will be better organized at a later time. Feel free to comment or e-mail me with your experiences or suggestions. Read your Homeowner's Policy and Renewal Certificate. The policy is a booklet with a detailed explanation of what is covered. If you do not have this, ask your local agent for a copy. It is not always given to you at renewal time. The Renewal Certificate is given to you yearly when you renew your Homeowner's Policy. It has the cost and the extent of your coverage. Make a list of questions as you read these items. Check your coverage with your insurance company before the hurricane season begins. Have your local agent explain your coverage and answer your questions. Ask about flood insurance. Place your copy of your Homeowner's Policy and Renewal Certificate, along with contact numbers for the insurance company, in your emergency/evacuation supplies. Place these items in sealable kitchen bags for protection and quick reference. 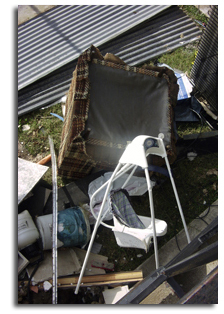 If possible file your claim (800 number) with the insurance company immediately after the storm. In some cases your insurance company will isssue a check for Additional Living Expense (ALE) to use while you are displaced from your home. Take photos of the contents of each room of your house and yard. Do not forget to read your policy to see if it covers damage to out buildings (tool sheds, greenhouses, etc.). Develop the habit of taking pictures and archiving receipts, instruction manuals, etc. the same day the item is purchased. This will keep your inventory up-to-date. Digital photos are the best, but traditional film can be developed and burned on a disk for a small fee. Most insurance companies will require proof of ownership in the form of photos, owner's manuals, receipts, etc. Save this information in several forms....electronic, notebooks, portable file boxes, etc. Your method will depend on your budget and the electronic equipment you have available. I suggest a portable file box with folders. Even if you have information on your computer, store backup CDs in this file box. A file box is more portable than a computer during evacuation. Take your camera with you during evacuation. Take photos of everything when your return. Do not dispose of anything until you take a photo. Each time you take a picture, keep a log of date, time, location, and type of damage seen. Even though we had digital cameras, we always pack disposable cameras in the emergency/evacuation supplies. If your file box is large enough, pack a few cameras inside.